If you use Pay As You Go (PAYG) on Oyster or contactless to get around London's transport system, there's big news for you in next year's fares announcement: the cost of peak daily capping is being seriously reduced. Peak and off peak capping are being withdrawn and replaced by one set cap per fare zone. If you travel within zones 1-3 you're laughing, as the new cap is lower than the previous off peak rate. If you live further out and travel into the centre off peak, you're likely to be more piqued as the cap is lower than the current peak but higher than off peak. The reason behind this change is the campaign to bring in a part-time travelcard. Long the favourite cause of the Liberal Democrats, earlier this year Boris Johnson asked Transport for London to look into a travel option to help people who don't work the traditional five day week. We've all assumed this would mean something like a three day travelcard, but instead TfL has just slashed daily caps to make it cheaper for people who travel ad hoc in peak time. So now, if you live in zone 3, you'll only need to take a return tube journey and a bus and you're quids in. It should also iron out some of the discrepancies between Oyster PAYG and contactless users, where contactless has the benefit of weekly capping but Oyster doesn't. Elsewhere: yes, other fares are going up. Seven day travelcards are increasing by between 2.2% and 2.5%, single cash fares are going up by 10p (unless you want to travel further than zone 5, where you'll get a 20p-30p increase) and PAYG single fares are going up by 10p. Day travelcards are going up with a bump too: the off peak day zone 1-6 and peak zone 1-2 travelcards will no longer exist, making the cheapest day travelcard a whopping £12. 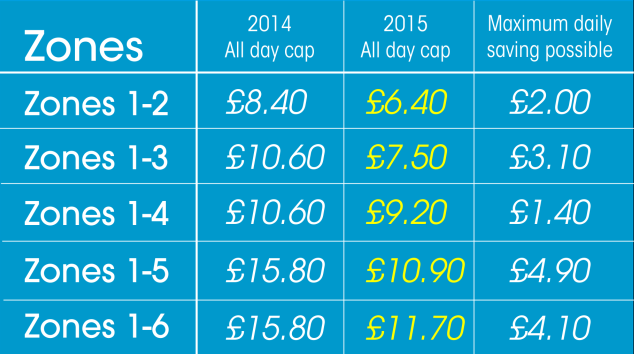 On buses, a single fare will increase 5p to £1.50 but the daily PAYG cap remains the same at £4.40. The one day bus and tram pass is also being reintroduced, costing £5, to help tourists and infrequent visitors who are foxed by cashless buses. It'll still need to be bought at a station or ticket stop though. You can see more detail in the PDF uploaded to the GLA website.